How do I Enable CUDA in Premier Pro CS6 without a Quadro? There’s probably a number of us out there that are using Adobe’s Premiere Pro CS6 to edit video for indy level and zero budget projects; and as that usually implies there’s 0 budget for a professional graphics solution to get things flying. Fortunately while it’s not supported by default in Premiere, most Nvidia gaming class cards, i.e. the GeForce line, can be used for CUDA workloads. This is especially true for modern Nvidia gaming cards where even low end cards are more powerful than the high end cards that were enabled in CS6. The default list of supported cards is stored in the file cuda_supported_cards.txt, in your Premiere Pro directory. Premier Pro CS6 officially supports only the cards in that list, and while there’s no guarantee it will work, so long as your card is at least a GeForce 200 series or newer, it should be able to accelerate GPU enabled effects. On Windows, Premiere Pro CS5.5 and CS6 do not support AMD or Intel GPUs at all. Creative Cloud 2014 improves the situation for AMD and Intel users. Adobe now supports OpenCL, a cross platform API that is implemented by Nvidia, AMD, and Intel in some form or another. Creative Cloud 2014 users, should be able to enable GPU acceleration using any Nvidia card newer than a GeForce 200-series, any AMD GPU newer than a AMD Radeon HD 6000 series, some AMD A10 APUs, and Intel’s Iris and Iris Pro iGPUs in their Haswell and newer CPUs. The officially supported hardware list for Creative Cloud is available here. In a move I never would have believed, thanks to Danny in the comments, I’m updating this for an even easier way to implement GPU acceleration in Premiere Pro. It turns out, you don’t actually have to add your card to cuda_supported_cards.txt file. Instead you can delete—or rename the file if you want to keep the original—and Premiere will assume your card is supported and enable CUDA. I can confirm that this method works for me as I’ve renamed my cuda_supported_cards.txt to cuda_supported_cards.txt.bak and Premiere will happily start up and provide CUDA acceleration. If this method doesn’t work for you, then you will want to use the following procedure to add your card to the cuda_supported_cards.txt. Start by using the GPUSniffer.exe provided with Premiere to get the device name for your card. This may sound a bit redundant, as the device name is pretty obvious if you know what you installed, but Adobe is very specific about the name that’s used, including capitalization. GPUSniffer is a command line tool (you’ll need to run it from the cmd prompt) in the Premiere Pro directory; for example, C:\Program Files\Adobe\Adobe Premiere Pro CS6, for Premiere Pro CS6. The program will spit out something that looks like the following image. Look for what’s listed where it says “Name” under “GPU Computation Info” section. Copy that, and paste it into the end of the file cuda_supported_cards.txt. Premiere is case sensitive; the text must be capitalized exactly the same way it appears in the GPUSniffer output or Premiere won’t detect your card. Save the text file, and that’s it; CUDA support should be available next time you start Premiere. If you’re running Windows 7 or newer, you’ll need administrator permissions to save the file. The easiest way around this is to save the file to your desktop, and then copy it back to the Premiere Pro folder with explorer. When you do this, Windows will ask you for permission to to preform an elevated action. You can check that you’re running the CUDA engine and rendering things on your GPU a couple of ways. First, in Premiere Pro under Project -> Settings -> General the video Render should now read “Mercury Playback engine GPU Accelerated”. Secondly you can download a program like GPU-Z which can monitor and display GPU loads and watch that while playing GPU accelerated clips. By the way, GPU accelerated clips will be covered by a little yellow bar (instead of green, for rendered, or red, for un-rendered) in the time line. Alternatively, if you’re running Windows 10, you can observe the GPU activity in the Task Manager instead of using a 3rd party application. All this said, keep in mind that unsupported GPUs are not a free ticket to ride. Non Quadro cards still won’t be able to accelerate Speed Grade and this workaround doesn’t exist for it. Also remember that running in this configuration isn’t supported by Adobe. Best case, if you run into a problem some kind soul may unofficially help you. Worst, case you’ll have to deactivate the GPU accelerated render and see if the problem persists, or buy a Quadro and reproduce it under that. Finally, there may be quality issues related to rendering on consumer graphics cards that don’t occur on the professional ones due to variances in hardware. In short, getting Premiere Pro running on a consumer grade GPU is a great trick for an indy or 0-budget production, but it comes with the potential costs of having things just not work and not being able to get official help for it. Q: I added my card to the cuda_supported_cards.txt file, but it doesn’t work? A: Make sure the card name is spelled and capitalized exactly like it is in the output from gpusniffer.exe. Q: How do I copy text from the command prompt? A: Select the text using the mouse like you normally would, then right click to copy the text to the clipboard. Q: Is there a similar solution for After Effects? A: Yes, you can add your card to ray_tracer_supportedcards.txt in the After Effects folder, and After Effects will accelerate ray tracing operations with your GPU. Q: Does deleting the After Effects ray_tracer_supportedcards.txt file work the same as it does with Premiere Pro’s cuda_supported_cards.txt? A: No, that doesn’t seem to be the case. Q: What versions of Premiere Pro does this work for? A: I’ve personally done this in both CS5.5 and CS6. It’s been confirmed to me that the same procedure applies to Creative Cloud as well. Q: Will enabling CUDA support speed up my export times? A: That depends. While Premiere Pro uses CUDA acceleration while exporting if it’s available, there are some limitations to what the GPU can accelerate and when it will be used. The big caveats are that GPU can only accelerate effects that support GPU acceleration. These are indicated in the effects panel by the GPU accelerated icon. If you’re using effects that can’t be GPU accelerated, then your export times won’t improve. Moreover, the GPU isn’t used for compressing the rendered video, so the usual limitations of say h.264 compression speeds will apply. For a more in depth look at export performance, you may be interested in my article looking at the performance aspects of exporting in Premiere Pro. Really Usefull!!! Thanks! ;) Works great for me! Damm, I’m sorry for double comment but this doesnt let me edit the previous coment. The instructions outline here specifically apply to Premiere Pro. As far as I know, Photoshop will use GPU acceleration (OpenGL) on any card as long as you tick the box in settings to enable it. After Effects can CUDA acclerate the ray tracing engine, and that can be activated in a similar manner by adding your card ID to the end of raytracer_supported_cards.txt in the Support Files directory of After Effects. Though I haven’t verified what impact it makes or how well it works, nor do I know how to confirm that it’s running. I’m not aware, off hand, of any other CUDA enabled applications in the Creative Suit. Wow. Excellent article. Even works on laptops. Worked on my GeForce GTX 660M. That’s good to hear, especially that it works with mobile GPUs. When I run Premiere CS6 I can enable GP Hardware acceleration. But the video will not play in any window in Premiere with GPU hardware enabled. The sound does play. I have run gpusniffer, set the 3d options in the nvidia control panel. 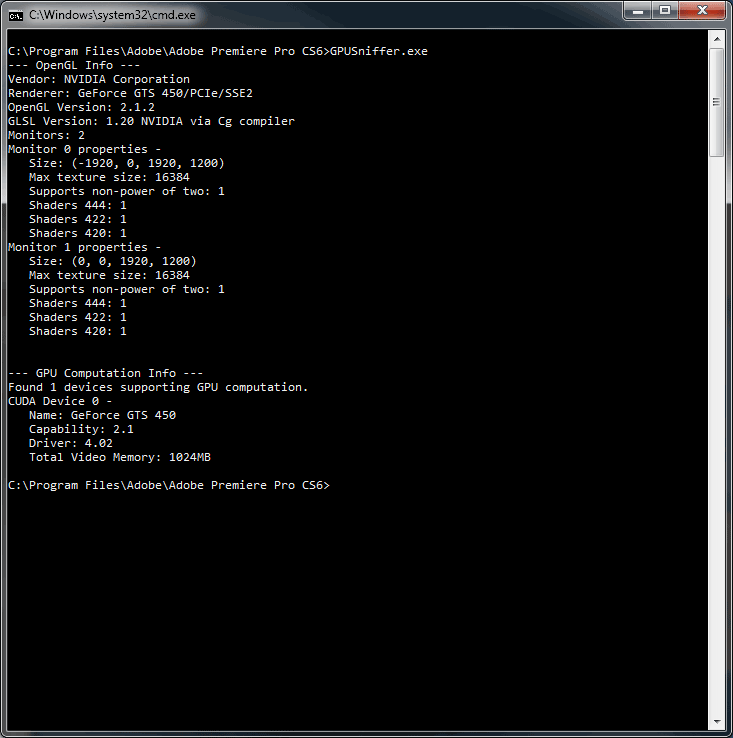 Appended the cuda txt document correctly, I am using the latest nvidia driver 314. I am pretty sure it was working on premiere 5.5 when i had it installed. Since you’re getting the option to use the GPU accelerated playback engine, you’re right that you got the cuda txt file setup correctly. If you hand’t you wouldn’t have had the choice in the first place. I don’t have any real good answers beyond that. The best working theory I can come up with is that something is preventing the video layer from being created or displayed, or your computer is sending it to a monitor that doesn’t exist. You might want to check that you’re not mirroring the display to an external port (win+p and make sure it’s set to computer only). Also it’s probably worth checking in the Premiere’s playback preferences to make sure the display isn’t active as well–not that that should make a difference. Out side of that, I’m not really sure. As I said, you got the setup right since you have the option to use the GPU accel version, I think it’s something else that’s interfering with the display after the fact. I have been unable to get it to work, but I did learn some new things from your answer! In case you might see something wrong there. Worked for me in booth instances (Premiere and AfterFX). GeForce 550Ti. Thank you. Most excellent! After reading V.J.’s post I went to ray_tracer_supportedcards.txt in the adobe folder and added my GT 610 to the top of the list, after changing the permission on the file so that I could save it I reopened adobe after effects and rendered a short 10 minute video in 8 minutes with GPU features enabled.. before that it was taking atleast 20 minutes to render the same video. I am greatful for the tip. :-)…. D.W. Capitalize the ‘F’ in GeForce. It appears to be case sensitive and needs to appear exactly as it does in the GPUSniffer output. At least on my machine, I have a GTX 660, if the line reads “Geforce GTX 660” CUDA support doesn’t work, if it reads “GeForce GTX 660” then CUDA support does. Did you know you can just delete the file and it’ll do the same thing? No need to add your GPU to the file! Good to know, I wouldn’t have expected that to work. Good to know, I’ll update the article to include that. @Dilip Bhatti, so far as I know you can’t. I had same problem as Morris, and what I screwed up was a simple space field after the card name in the txt file. I took me a while to spot it and delete it, but now everything works, thanks for the helpful tut! Well done. Thanks … It works just perfect for my GTX 760! Just renamed. Can confirm this works exactly the same way on Creative Cloud. Re CC: Thank you for confirming that. Thanks! I knew vaguely that something had to be edited for cards that are not natively supported by CS6 – but now that I switched from a 680 to a 780, it was the first time I actually had to do it myself. And thanks alot for the seperate AE setting, I didn’t even know this had to be edited seperately – good thing I read it here! It works fine whith my GeForce GTX 460. Premier reconize CUDA and propose to me the choice between GPU and CPU. But, when rendering, there is absolutely no difference in time (11 minutes for my project, with or without CUDA…). CUDA acceleration is used only for the preview rendering (the playback engine), not the rendering or compression done at export, which is always done using the CPU. If you’re just editing together clips without applying any adjustments, it’s unlikely you’ll see much of a benefit from CUDA acceleration. However, if you are making adjustments to your clips, then depending on the adjustment CUDA acceleration will allow real time full quality playback without pre-rendering that clip to a file. Hello man, i followed ur guide, in every step… i added my “GeForce GTX 780 Ti” on the list of the cards, and in premiere Cs6 no i can read under sequence setting that is accelerated… but, when im going to do the export, it take the same time to export… how is possible? As I noted in my last replay in this thread, the CUDA acceleration is only used for real time playaback while editing (in either the reference monitor or in the video device specified in the playback settings). 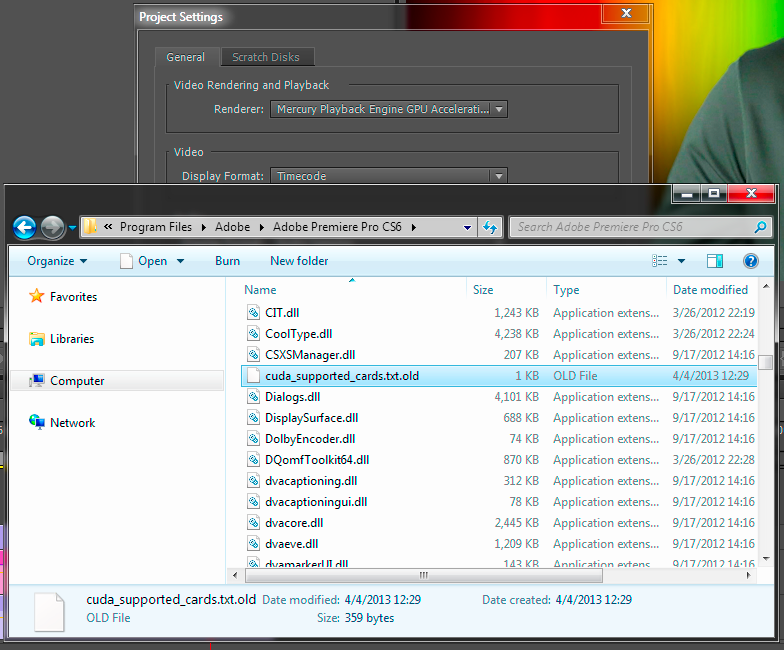 All of the processing done when exporting, both rendering the frames and compressing the video is done only on the CPU. I was mistaken, CDUA is used during export, but when being used for exporting, Premiere Pro sets the CUDA settings to high quality, as a result, the CUDA process may not be any faster than the non-cuda processes only higher quality. That said, one of the biggest time sinks when exporting is the compression step, which is not CUDA accelerated anyway. Though the CUDA processing may be speeding up some transformations and effects applied to the video, if you’re not doing a significant amount of complex transformations, the resulting speedup may be unnoticeable compared to the time spent compressing the resulting frames. Jason, I appreciate your response in advance. You’ve mentioned that “CUDA acceleration is used only for the preview rendering (the playback engine)…” and this is exactly why I bought the geForce GTX 750ti. But after making the change you describe in the article, playback is still really choppy. 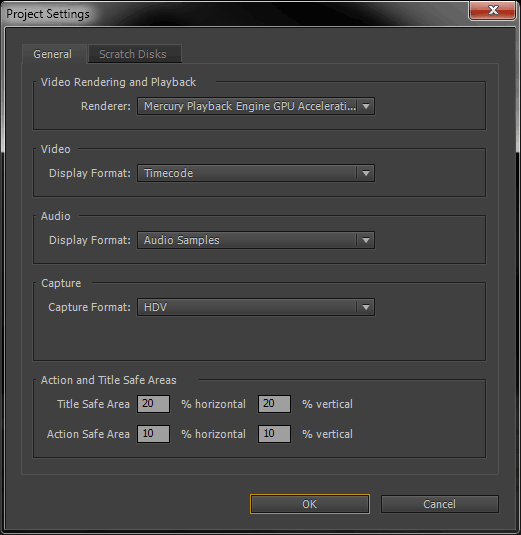 I followed the steps to let my Premiere Pro CS 5.5 recognize my geForce, and it worked as expected. “Video Rendering and Playback” now looks exactly like picture 3 of 3 above, saying “Mercury Engine Playback GPU Acceleration”. In fact, the red bar directly above the video clips changed to yellow, signifying that it doesn’t need to be rendered before experiencing a smooth playback. But the video playback is still WAAYYY choppy and can’t keep real time with the time scrubber as I playback the video. Am I missing something here??? Without knowing a lot more about your computer, the video you’re working on (1080p? 4K? ), the effects your applying to it, and so on, it’s virtually impossible to be able to tell you what you might be missing or how to correct it. Pre-render a sequence, and see if the playback issues go away. If they do then it’s a real-time rendering problem, if they don’t then it’s potentially a problem elsewhere (disk I/O, CPU, system bandwidth somewhere). Double check that you don’t have any non-accelerated effects in your sequence. Double check that you’re not running any other software that could be using the GPU. Update your GPU drivers to the latest WHQL release from Nvidia. It’s also possible that there’s some other incompatibility with CS5.5 and the 750Ti. If none of that helps, drop me a line via the contact form, and I’d be happy to discuss the situation in more detail–though I can’t make any promises. On another note, after doing the trick shown in the article, the Mercury Playback Engine GPU Acceleration only remained a rendering option for about a day. It somehow must have turned off because I just booted up my Premiere Pro session again and got this error: “This project was last used with Mercury Playback Engine GPU Acceleration, which is not available on this system. Mercury Playback Engine Software Only will be used.” However, I’m using the same computer and everything as I was just hours ago…is this an issue you’ve heard about? The cuda_supported_cards.txt file, the one I renamed, is still named the new name I gave it which allowed me to opt for the Mercury Playback Engine GPU Acceleration in the first place. Doesn’t work with GeForce GT 635M 2gb – Black video :(. Am I missing a step? I’m really hoping that i can get this working because my new GTX960 is not currently being recognized. You could try creating the cuda_supported_cards.txt file with just GeForce GTX 960 to the first line. I just tired that on my machine, and it worked properly. I’m not sure why the file or the gpusniffer.exe aren’t in your Premiere Pro directory, that’s a condition I’ve not yet come across yet. How do I finish this problem fot mac , Intel HD 3000 ? To the best of my knowledge you can’t. Intel’s HD 3000 graphics processor does not support CUDA (the API used by Premier Pro CS6 and CC) or OpenCL (the alternative API available in Premier Pro CC), as such it’s impossible for it to accelerate Premier Pro on that GPU. I am using Adobe Premiere Pro CC 2014 and i have installed Quadro FX 4600 but its not supporting. I added into cuda_supported_cards.txt but still not success. can any one help plz. The Quadro FX 4600 is a very old GPU that predates the minimum GPU revision that the software can actually work on. You’ll need a newer GPU (Quadro FX 4800 or newer if you want to stay with quadros, GeForce GTX 200 series or newer if you’re okay with a consumer card). Thank you so much for your reply sir. I agree with u that its an old card but how come that After Effects CC 2014 has enable this card and i am using it and Premiere pro CC 2014 Can’t. That’s a good question. The only information I have is that Premiere Pro needed the GPUs in the GeForce 200 series and newer (even that may be overly broad given that the 200-series had both CUDA 1.1 and CUDA 1.3 parts). The AE team may have chosen to target different APIs or started work on GPU acceleration before the Premiere team did and thus retain different limitations on the lower end. Hi, My GPUsniffer doesn’t stay open for more than a mili second , is there another way to fetch the card’s name? You have to run GPUSniffer.exe from the command prompt, not by double clicking on it in explorer. To do this you need to start the command prompt by pressing Win+R to open the Run dialog. Then enter cmd in the run dialog that appears and click OK. In the new window that opens, type ‘cd "\Program Files\Adobe\Adobe Premiere Pro CS6"‘ without the outer single quotes, and press enter. The prompt will change from something like C:\users\yourUserName> to C:\Program Files\Adobe\Adobe Premiere Pro CS6>, now you can type gpusniffer.exe and hit enter again and the results will stay visible. That said, you can also use the method where you make a backup copy of the cuda_supported_cards.txt file in another directory, and then delete the one in the Premiere Pro directory. Multiple people have reported to me, and this has worked for me as well, that this will enable CUDA support. I don’t have Premier Pro CC 2018, so I’m not sure what Adobe is currently doing — they very well may not be using the cuda_spported_cards.txt approach anymore. Unfortunately, Creative Cloud is a constantly moving target which means that what worked in one version may no longer work in the next.